In addition to the overhead lines we come across every day, electrical power can also be both transmitted and distributed using Underground cables. These underground cables, of course, come with their own set of advantage and limitations. Aside from better general appearance and lesser interference with other amenities, the advantages include smaller voltage drops and lesser probability of fault occurrence. On the other hand, they have higher production and installation costs, and hence are used wherever overhead lines aren’t viable due to practical limitations or risks involved. Hence we employ them in specific places such as urban areas with high population densities and across water bodies (as submarine cables). Conductor: Usually, 1 or 3 conductors (depending upon the application) are used. These conductors are stranded to reduce skin effect, proximity effect and to keep it flexible. Conductors are made from electrolytic grade pure copper or aluminium. Conductor screen: It is a semi-conducting tape or an extruded layer of a semi-conductive compound. Conductor screening is generally used in MV and HV cables to maintain uniform electric field and minimise electrostatic stresses. Insulation: It is provided to withstand the electrostatic stress. Various types (and thickness) of insulators like VIR (Vulcanized India Rubber), Impregnated paper, PVC (polyvinyl chloride) and XLPE (Cross linked polyethylene) are utilised depending upon the applied voltage. Insulation screen: A layer of semi-conductive material generally used in MV and HV lines. It serves the similar purpose as that of conductor screen. Metallic Sheath: It provides protection to the cable from moisture and other chemicals (acids or alkalies) present in the environment or soil. It’s usually made up of Aluminium or Lead. It also provides a path for fault and leakage currents as the sheath is earthed at one cable end. Bedding: It is a low grade insulator like Jute or Hessian which protects the metallic sheath from corrosion and from mechanical injury due to armouring. Armouring: It provides mechanical protection from various stresses the cable may get exposed to during its installation and operational life. It’s usually a steel tape wound around the Bedding layer. Serving: Another layer of low grade insulator like Jute or Hessian or a thermoplastic compound like PVC is again provided to protect the steel from atmospheric contaminants and agents. Extra super voltage cables which are used for applications with voltage requirement above 132kV. 1. Belted cables: As the name suggests, it has an additional layer of oil-impregnated paper which is wound around the insulated conductors. Such an arrangement is useful for low and medium voltage levels up to 11 kV. 2. 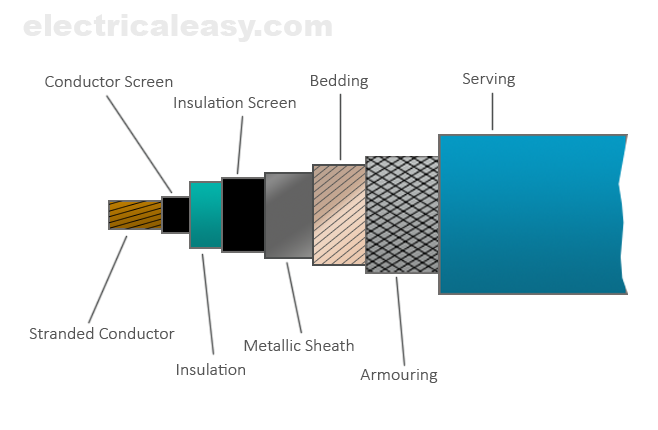 Screened cables: Used only in particular applications with specialised construction, these Underground cables can be further divided as H-type and S.L-type cables. 3. Pressure cables: These are used when the voltage requirement exceeds 66kV and solid cables can't be used. Either pressurized gas or pressurized oil is used in these cables.